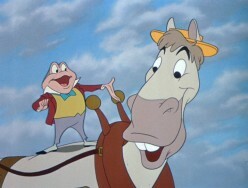 My girlfriend and I enjoyed a fun treat tonight — watching the Disney version of The Wind in the Willows. When I was a kid, I’d loved “Mr. Toad’s Wild Ride” at Disneyland, and now that I’m older I’ve also had a chance to appreciate the original book by Kenneth Grahame. Yet somehow through all that, I’ve never had a chance to see the entire cartoon by Walt Disney — at least, not since I was a kid. So tonight, I was finally going to get to watch it. It didn’t start again until 1945 — and by then, it was trimmed down until it was just half of a two-story movie. (The other half being The Legend of Sleepy Hollow.) This leaves the movie feeling kind of lopsided — although it also feels more like a storybook instead of a Walt Disney cartoon, with Basil Rathbone providing the narration.